A team of scientists in the U.S. and China has created programmable DNA origami nanorobots that can seek out and shrink tumors by blocking their blood supply. Tests in mice carrying breast, melanoma, ovarian, and lung tumors showed how the DNA nanorobots homed in on cancer-feeding blood vessels and induced the formation of clots, which effectively shut off the tumors' lifeline of oxygen and nutrients. The results included stunted tumor growth, shrinkage of existing tumors and metastasis, and inhibition of metastases. Animals treated using nanorobot injections survived for longer, and in some cases demonstrated complete tumor regression. Critically, the nanorobots were found to be safe and didn’t trigger immune responses when tested in normal mice and pigs. Starving tumors to death by selectively cutting off their blood supply is an attractive strategy against cancer, the authors explain. Using an approach that causes vascular occlusion, for example, could start to work within just hours, and would also be applicable to just about any type of tumors. To achieve this, Prof. Hao Yan’s team turned to DNA origami as the foundation for developing a DNA nanorobot system, based on a self-assembled nanotube, which could deliver the coagulation protease thrombin specifically to tumors and essentially cause thrombosis in tumor-feeding blood vessels, but without affecting vasculature in healthy tissues. The project was started 5 years ago, when the NCNST researchers first looked at cutting off the tumor blood supply by inducing blood coagulation using DNA-based nanocarriers. Hao Yan's longstanding expertise in DNA origami expertise has allowed the nanomedicine concept to be upgraded to a fully programmable robotic system. “These nanorobots can be programmed to transport molecular payloads and cause on-site tumor blood supply blockages, which can lead to tissue death and shrink the tumor,” notes Prof. Ding. Each nanorobot is created from a flat, rectangular DNA origami sheet, just 90 nm by 60 nm in area, and just 2 nm thick. Four thrombin molecules are attached to the origami sheet surface, which is then rolled up into a hollow tube with the thrombin molecules protected on the inside. The tube structure is held together by fastener strands that include DNA aptamer molecules designed to nucleolin, a protein specifically expressed on tumor-associated endothelial cells. 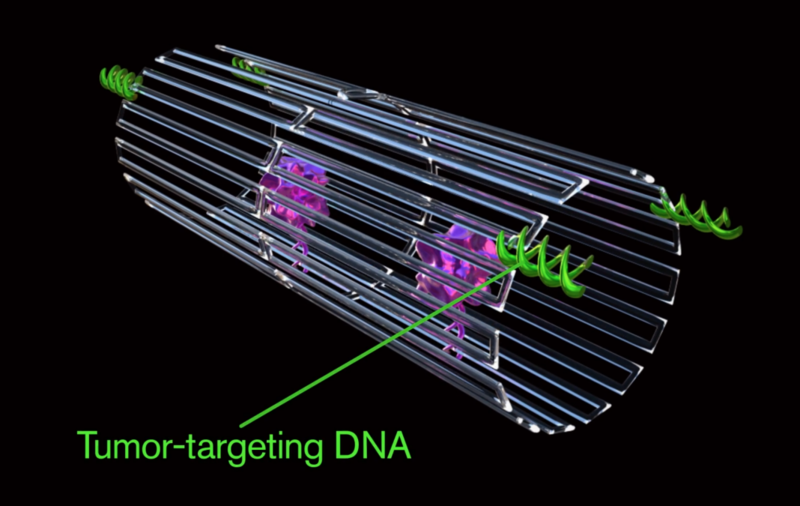 The final construction is a hollow, tube-shaped DNA nanorobot with a diameter of about 19 nm and a length of about 90 nm. The scientists hypothesized that the aptamer molecules on the DNA nanorobots would recognize and bind to their nucleolin targets on tumor blood vessels, triggering the fastening strips to pop open. This would allow the nanorobot to spring back into its original shape and so expose the blood vessels to the thrombin, causing the development of thrombosis. The team first used fluorescent beacons to confirm that the nanorobots opened up as expected when bound to nucleolin. They then carried out a series of in vitro experiments to show that the thrombin-loaded nanorobots (nanorobot-Th) caused coagulation. The researchers next evaluated the nanorobots in mouse models in vivo. Fluorescence imaging studies showed that nanorobots accumulated in breast tumors carried by experimental mice and bound to the tumor vascular endothelium. Further analyses showed that nanorobot administration led to blood vessel occlusion in the tumors within just 24 hours; by 48 hours there was advanced thrombosis, and by 72 hours dense thrombi were evident in all the tumor vessels. Encouragingly, there was no evidence of thrombi or other abnormalities in any of the animals’ major organs, “verifying that thrombosis was specific to the tumor vasculature,” the authors state. Additional studies in tumor-bearing mice confirmed that nanorobot injections led to much slower tumor growth, “indicating a therapeutic effect in inhibiting tumor growth,” and significant increases in animal survival. The nanorobot therapy was particularly effective in a melanoma mouse model, in which three of eight treated mice showed complete tumor regression and more than double median survival time. The nanorobot therapy also effectively prevented the development of melanoma metastases in the liver, “which can likely be attributed to the inhibition of primary tumor progression or to the regression of vascularized metastases,” the researchers write. The nanorobots were even effective in mice bearing xenografts of human ovarian cancers, which are less vascularized than some tumor types. In these animals, nanorobot therapy still significantly prolonged survival, and while the results were “not as remarkable” as in the melanoma model, they did “nonetheless show that limited tumor permeability does not prevent the nanorobot from exerting antitumor activity,” the team comments. Particularly encouraging therapeutic results were generated in a mouse model that faithfully mirrors the clinical course of human lung cancer. Tumor-bearing animals received nanorobot injections every 3 days for 2 weeks. Imaging and tumor-staining studies showed that after treatment the tumor regions were “riddled with intratumoral spaces,” which indicated that tumor growth was retarded. Staining studies also highlighted thickening of alveolar wall and fibrosis, “suggesting a consequential remodeling of the tumor tissues into normal lung tissues,” the authors claim. The team also carried out extensive safety studies in two different mammals, including the Bama miniature pig, which is physiologically and anatomically very similar to humans. “The nanorobot proved to be safe and immunologically inert for use in normal mice and also in Bama miniature pigs, showing no detectable changes in normal blood coagulation or cell morphology,” comments Prof. Yuliang Zhao. Importantly, there was no evidence that the nanorobots spread into the brain. “Treatment with [the] nanorobot-Th system did not lead to any significant variations in the blood coagulation parameters or histological morphology when compared to the control group, demonstrating that the nanorobot-Th is decidedly safe in the normal tissues of large animals,” the authors write. “DNA nanorobotic systems, such as the one we describe here with targeting and triggered release properties, may inspire the design of novel cancer therapeutics modified with different targeting ligands to mediate delivery of multiple biologically active payloads, such as short interfering RNA (siRNA), chemotherapeutics or peptide drugs,” the authors suggest. They are now looking for partners to develop the technology for clinical applications.